While there are many ways of growing your LinkedIn network, I’d like to share one with you that is remarkably easy and effective, strategic, and likely one that you haven’t seen before. Convert highly connected group-only connections to 1st degree connections. Why is this so effective? Specifically converting highly connected people people who are beyond your 3 degree network on LinkedIn to 1st degree connections yields you the largest net gain to your 1st, 2nd, and 3rd degree networks. Sending invitations to connect to people you share a group with is one of the easiest and most effective methods of connecting with people you don’t know directly. If you’re one of those folks who thinks you shouldn’t connect to people you don’t know on LinkedIn, I’ve got an article coming on that subject shortly – so stay tuned. Super connectors (people who are highly connected on LinkedIn) are more likely to accept invitations to connect from people they don’t know personally. First, you’ll need to be a member of/join a combination of some of the largest general and smaller niche LinkedIn groups that you can find that are relevant to you and the people you’d ideally like to connect with. You can find the 50 largest LinkedIn groups here. Then, go into any group you’re interested in searching for people to connect with. Because we are looking for highly connected LinkedIn users, we can’t really use the standard Group search to quickly find highly connected people. This is because searching within groups is automatically (and only) sorted by “relevance,” which is a combination of keyword relevance and relationship, which is exactly what we don’t want, as we need to identify people beyond our 1st, 2nd, and 3rd degree network. Once you’ve found a highly connected group member that you would like to connect with, you can click “Connect.” However, sometimes I’ve found that the “Groups” option is not listed as a choice in response to “How do you know <firstname>?” even though we do in fact share a group. You don’t need to target a specific group in order to identify highly connected people with whom you share a group. You can begin a search using LinkedIn’s Advanced Search and sort the results by connections. 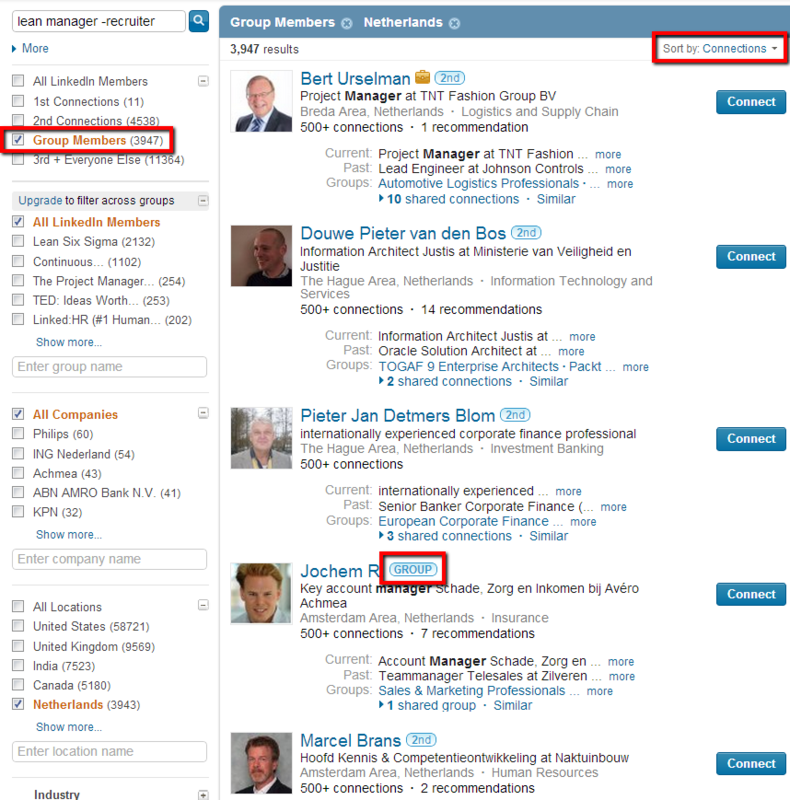 For example, I’ve run a very basic search for demonstration purposes below – targeting people in the Netherlands who mention lean, manager, and not recruiter – and I’ve sorted the results by Connections. I’ve found someone that is a Group-only connection – Jochem R.
I can click the blue “Connect” button to begin the connection request process. If the Groups option is present as a means of explaining how I know Jochem, I can select that and the appropriate group as an option. If it is not present, you can use the method I detailed in the YouTube video above to make the Group option appear so you can leverage it to send a connection request. 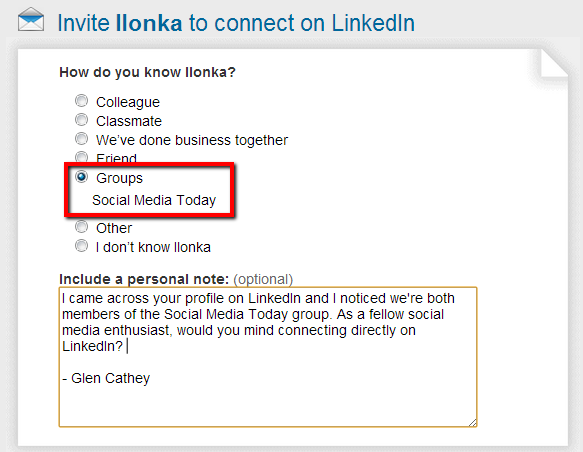 Have any other tips for quickly and effectively increasing your LinkedIn network in a targeted fashion? Please share them!